Brutus was born and bred in the east end of London; its name coming from the popular men’s aftershave Brut, which founders Keith and Alan Freedman both wore. It has now been re-invigorated by a new generation recreating the Brutus Trimfit from 1966 and ensuring that every detail matches the original. The Trimfit has a cult following among mods and suedeheads throughout the world and has been documented in numerous books and articles about British fashion. Short sleeve shirt by Brutus Trimfit made from NevaPress© polycotton (65% polyester and 35% cotton). 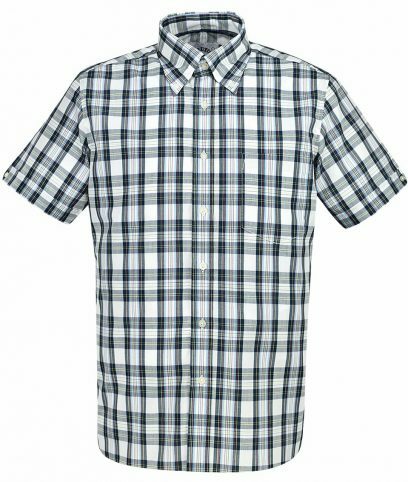 Blue, white and red check pattern with trademark button and vent detail. Button down collar. Shaped and darted for perfect waist fit. Comes with removable matching pocket handkerchief and holder. Short sleeve shirt by Brutus Trimfit made from NevaPress© polycotton (65% polyester and 35% cotton). 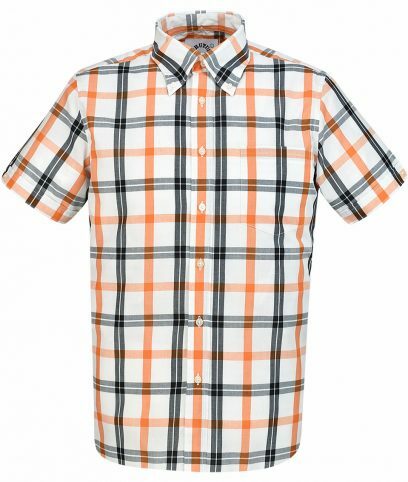 White, orange and black check pattern with trademark button and vent detail. Button down collar. Shaped and darted for perfect waist fit. Comes with removable matching pocket handkerchief and holder. 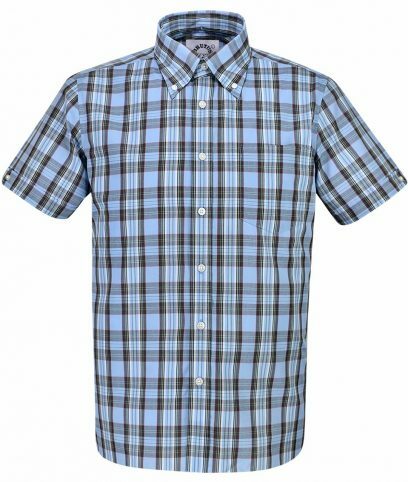 Short sleeve shirt by Brutus Trimfit made from NevaPress© polycotton (65% polyester and 35% cotton). 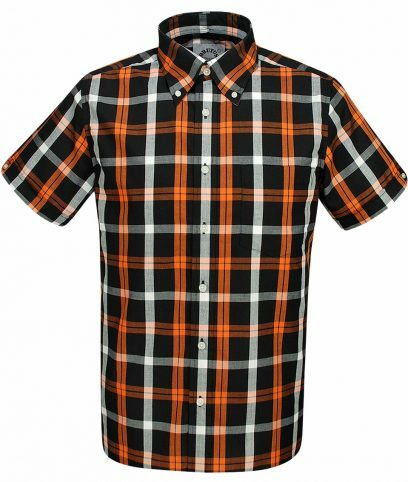 Black, orange and white check pattern with trademark button and vent detail. Button down collar. Shaped and darted for perfect waist fit. Comes with removable matching pocket handkerchief and holder. Short sleeve shirt by Brutus Trimfit made from NevaPress© polycotton (65% polyester and 35% cotton). 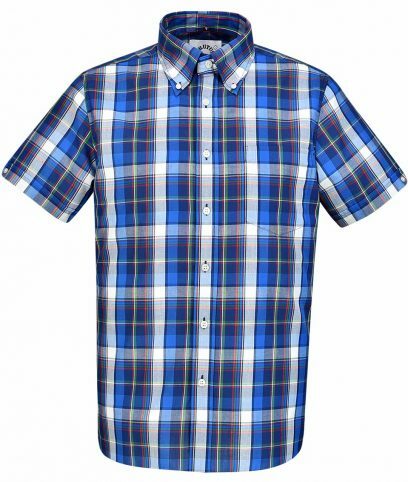 Navy, red and yellow check pattern with trademark button and vent detail. Button down collar. Shaped and darted for perfect waist fit. Comes with removable matching pocket handkerchief and holder. Short sleeve shirt by Brutus Trimfit made from NevaPress© polycotton (65% polyester and 35% cotton). Blue, brown, yellow and red check pattern with trademark button and vent detail. Button down collar. Shaped and darted for perfect waist fit. Comes with removable matching pocket handkerchief and holder. Short sleeve shirt by Brutus Trimfit made from NevaPress© polycotton (65% polyester and 35% cotton). 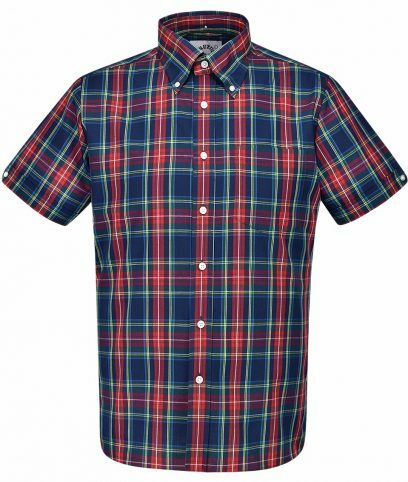 Red, navy, yellow and green check pattern with trademark button and vent detail. Button down collar. Shaped and darted for perfect waist fit. Comes with removable matching pocket handkerchief and holder. Short sleeve shirt by Brutus Trimfit made from NevaPress© polycotton (65% polyester and 35% cotton). White, navy, yellow and red check pattern with trademark button and vent detail. Button down collar. Shaped and darted for perfect waist fit. Comes with removable matching pocket handkerchief and holder. Short sleeve shirt by Brutus Trimfit made from NevaPress© polycotton (65% polyester and 35% cotton). 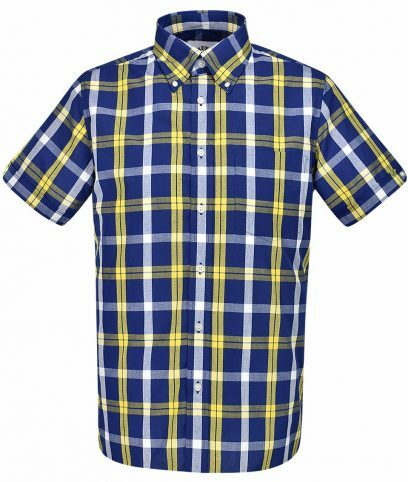 Blue, yellow and white check pattern with trademark button and vent detail. Button down collar. Shaped and darted for perfect waist fit. Comes with removable matching pocket handkerchief and holder. Short sleeve shirt by Brutus Trimfit made from NevaPress© polycotton (65% polyester and 35% cotton). 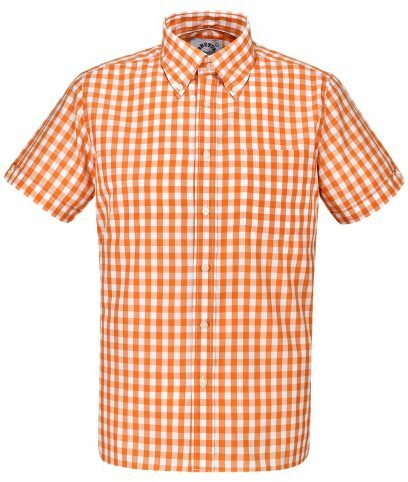 Orange and white large gingham pattern with trademark button and vent detail. Button down collar. Shaped and darted for perfect waist fit. Comes with removable matching pocket handkerchief and holder. Short sleeve shirt by Brutus Trimfit made from NevaPress© polycotton (65% polyester and 35% cotton). Orange and cocoa brown stripe pattern with trademark button and vent detail. Button down collar. Shaped and darted for perfect waist fit. Comes with removable matching pocket handkerchief and holder. Short sleeve shirt by Brutus Trimfit made from NevaPress© polycotton (65% polyester and 35% cotton). 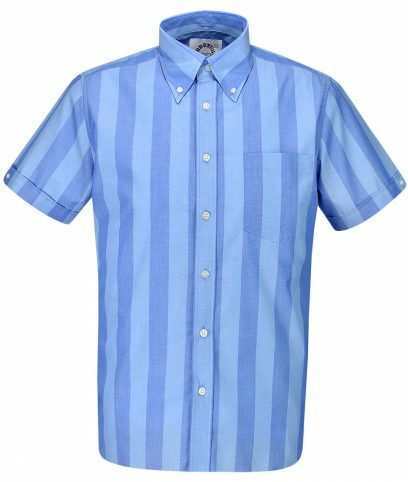 Silverlake and palace blue stripe pattern with trademark button and vent detail. Button down collar. Shaped and darted for perfect waist fit. Comes with removable matching pocket handkerchief and holder. Short sleeve shirt by Brutus Trimfit made from NevaPress© polycotton (65% polyester and 35% cotton). 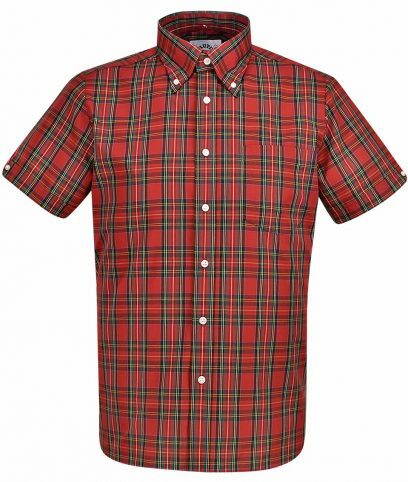 Red and white large gingham pattern with trademark button and vent detail. Button down collar. Shaped and darted for perfect waist fit. Comes with removable matching pocket handkerchief and holder.